I’m the proud, new owner of a tandem bike, a bicycle built for two. It’s old, a classic Canadian made CCM and I can assure you that it’s rather cumbersome to ride. Yet somehow it evokes the romance of cycling experiences enjoyed around the world. Bikes have been our conveyance of choice in many places, affording glimpses into varied, everyday cultures that could not have been replicated by car, train, or even on foot. 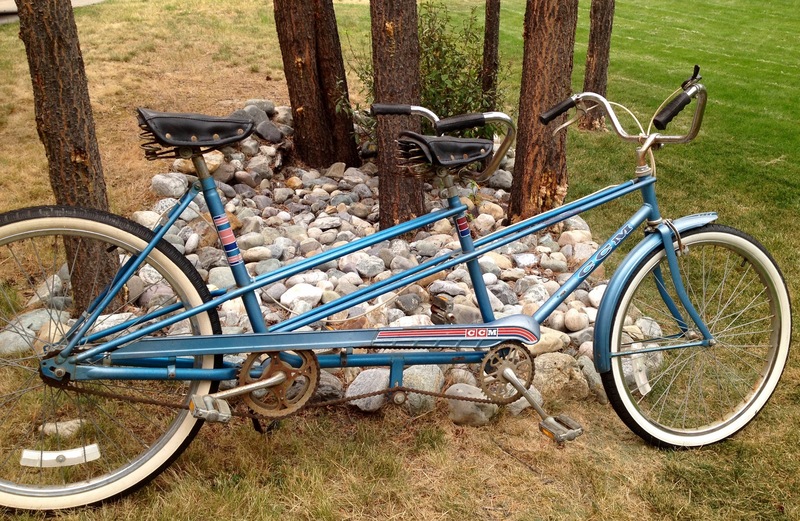 We’re in Canada for a number of months awaiting our next overseas posting and I’m sure we’ll master the tandem. Yet in our mountain city of Kimberley, BC, most townspeople either own a mountain or road bike. Cycling is a way of life here and like most locals, I took to biking on the wooded trails this summer. I enjoyed it, yet admit that my active imagination was preoccupied with the thought of bears, moose or deer crossing my path. Admittedly, part of me is more at home cycling in urban settings. I love the vibe of a bustling city; even better if you can discover it on a bike. On a recent trip to Amsterdam I wanted to get to the root of cycling; how does a society embrace it so completely as a mode of transportation? 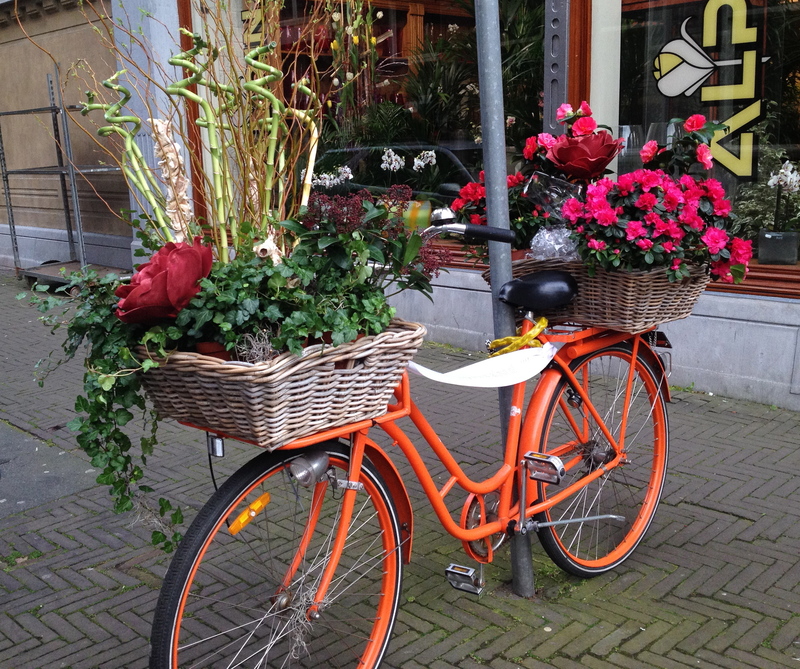 It’s common knowledge that bikes have evolved into the daily fabric of Dutch life. The Netherlands has one of the most efficient cycling infrastructures in the world. Many cities enjoy similar accommodations for cyclists; Copenhagen, Stockholm and Montreal for example, but the Dutch have truly mastered it. Almost 70 % of all journeys are made on a bike, or as we say in Dutch, a fiets. 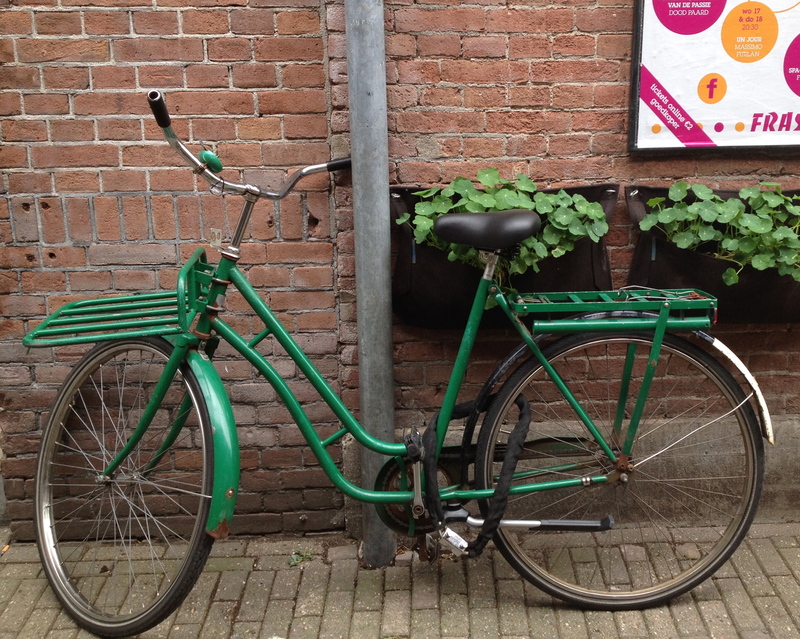 I fondly remember taking to my fiets daily when we lived in Holland. Through the cobbled streets of Oudewater I cycled, my first-born strapped into a seat slung from my handle bars. 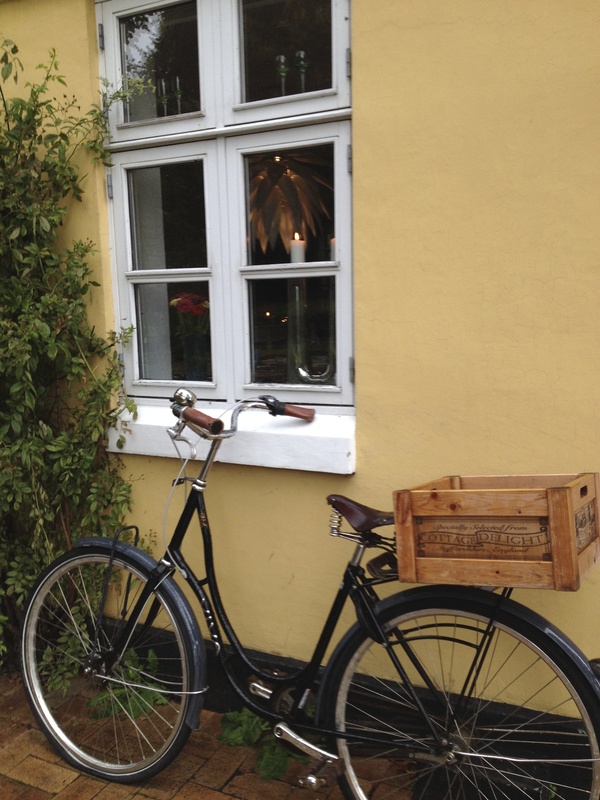 A wicker basket attached at the back, ready to carry home the daily shopping. No helmet, even on my little guy, and yes the thought of it now alarms me. It seems I became complacent to the obvious perils or simply, I adopted the Dutch culture. 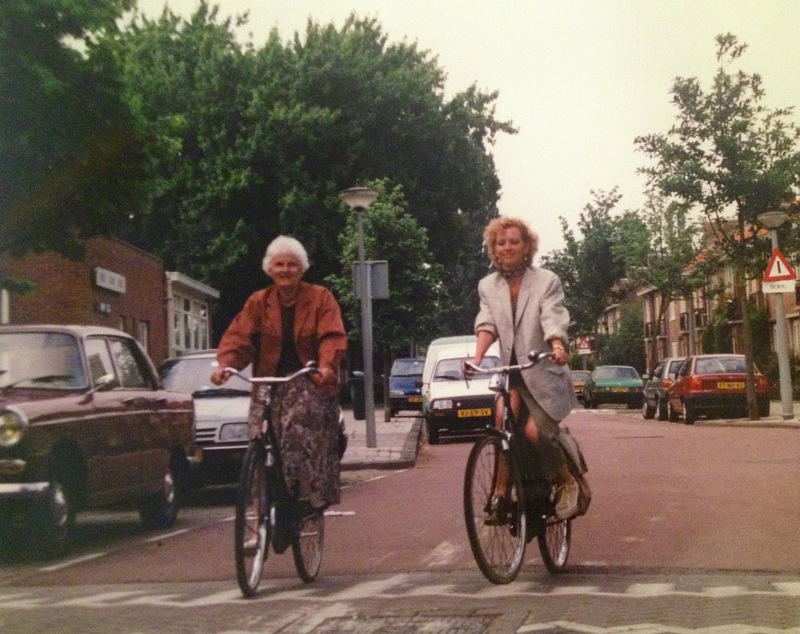 Bike stories from previous generations in Holland abound in my family. During war time, my grandparents improvised using garden hoses as tires when none were available. My mother and grandmother had a narrow escape when mercifully they hesitated to lean their bikes at a neighbour’s farmyard, then saw from a distance the building destroyed by a bomb a short time later. But there are also fond memories; three generations of us cycling across the border to Germany, evenings out in Amsterdam then cycling back to family along moon-lit canals, absorbed into the pulse of the city. The Government responded and promoted cycling as a mode of transportation; bike paths, junction lights and bike parks were built. 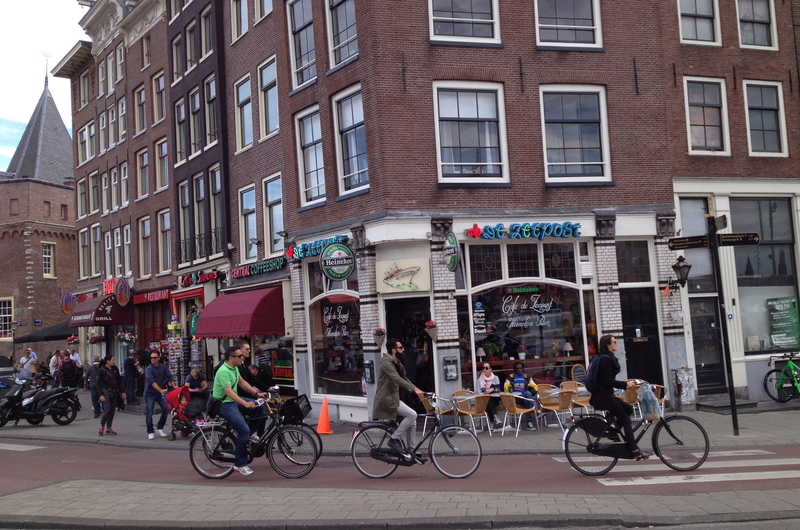 In fact today, there are more bikes than people in Amsterdam. About 800,000 of them, and as 84% of people have more than one bike, it’s fair to say the city is a ‘sea of bikes’. 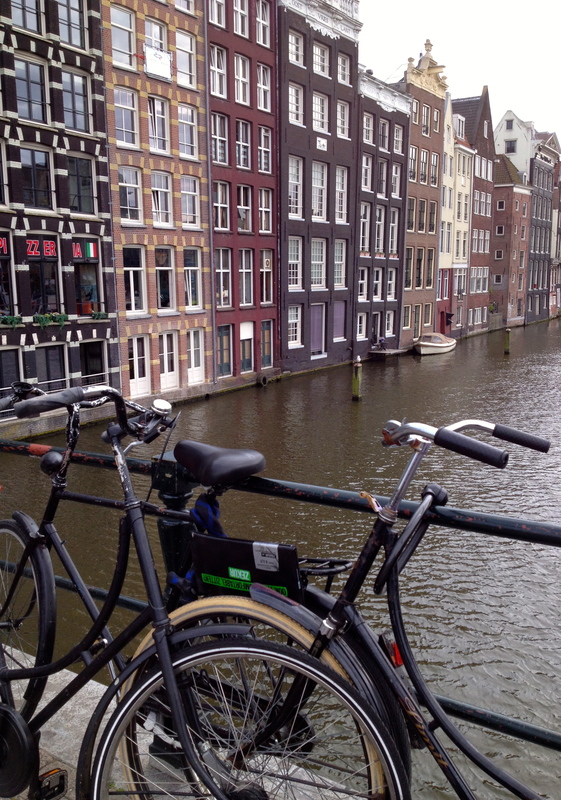 I still bemoan the loss of my beloved Dutch fiets that transported me along many charming streets. It had been stored in Amsterdam in my great-aunt’s shed but was eventually given away. How I wish it was in my garage today, at home with our seemingly endless array of bikes; if only for posterity. Those solid Dutch bikes are ‘people-movers’ as they’re pedalled with one, two, three, even four children at a time. Riding in any Dutch city during rush hour is a sensory experience. It’s terrifically busy, a constant flow of solo commuters as well as parents transporting their youngsters as they chat about their day. Sitting on the bike or in a cargo box (a bakfiets) the weather is of little consequence. After all, there are rain/cold weather covers which help during inclement weather. Especially when the family dog, the daily groceries or a case of Heineken is stuffed along-side the kids! Additions such as bakfiets are extremely functional but would have been unimaginable when two-wheeled machines first emerged in 1817. The invention is credited to Baron Karl von Drais from Germany. Drais invented the ‘running machine’, called a draisine. It was human-propelled and with no pedals, it was more walked than ridden. Hence it’s nickname of hobby-horse. 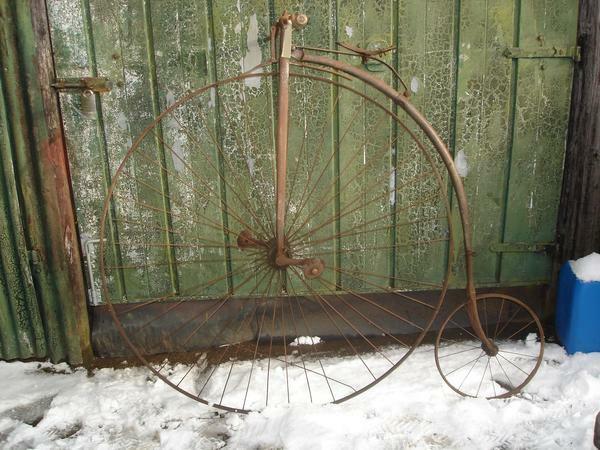 Eventually came the bone shaker, then the oddly shaped penny-farthing with a large front wheel and much smaller rear wheel. Rubber tires replaced steel-lined wood and in the 1890’s the safety bike evolved. It was the first machine to be called a bicycle; similar to the design we’re familiar with now. Many variants of the bicycle have evolved; to road and touring, mountain bikes, unicycles, rickshaws and back to fixed-gear bikes. ‘Fixes’ are single speed and use back brakes, stripped back down to the basics. The zest for simplicity has created a new subculture of riding ‘fixies’ in urban settings. 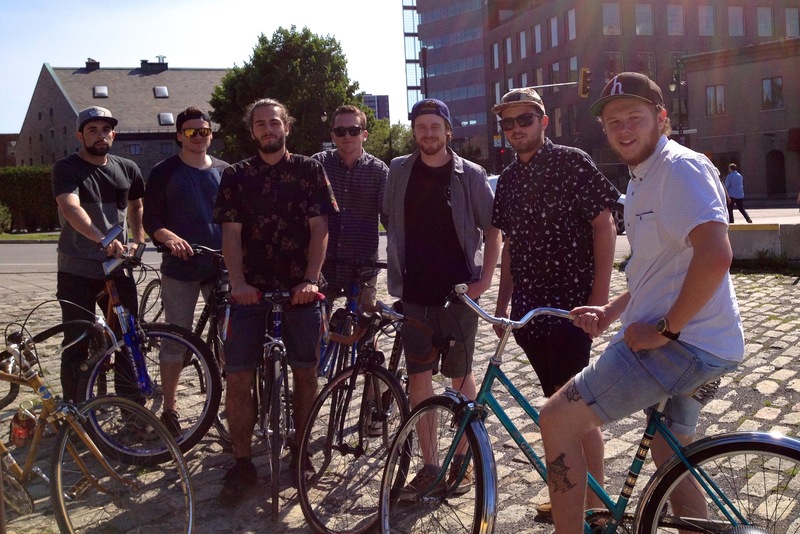 I came across such a group in Montreal, long a city of cyclists. They posed willingly for my camera but it wasn’t until later that I discovered they were sporting ‘fixies’. Chatting with a young man at a cafe in Calgary, he told me that he was studying in Montreal. I mentioned my blog and showed him my photos. “Ah, they’ll be on ‘fixies’ for sure,” He explained the new subculture that these riders have created with this retro trend; the old will be made new again it seems. For many of us who grew up in Canada, our bike experiences started with a trike, graduating to a set of rattly training-wheels, then onto a ‘banana seat’, and finally the thrill (in my day) of a 10-speed. We cycled endlessly. We got ourselves to school, around town and to our friend’s homes on our bikes. Whose front lawns didn’t have bikes splayed on them when friends came over? We would also jump on our 10-speeds after dinner, eager to see what was ‘going on’. “Be home by dark,” our mothers would holler as we sped off. Even today when my grown ‘kids’ hop on a bike, I find it heart-warming. Perhaps it evokes memories of those carefree childhood years, yet I believe there’s more to it than that. Riding a bike allows us an elemental, exhilarating connection with the world. No hard shell around us, no peering through a window, we are at one with our surroundings; and what surroundings we’ve been fortunate to have explored. I leaf through my journal from our six month backpacking trip in ’89. I find enticing cycling entries. 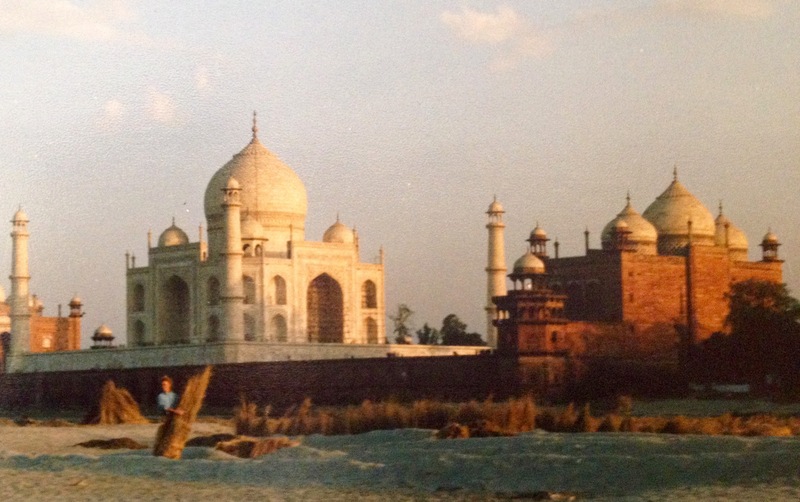 Agra, India, February…We chose the non-tourist view of the Taj Mahal today. With rented bikes we cycled through a small village along a train track to the nearly dried Yamuna River. There we beheld the most wondrous sight, the Taj Mahal to the south, the Agra Fort to the west. We were transfixed, not able to pull ourselves away from the view. At twilight the moon rose creating an ethereal mistiness that mingled with the Taj; regal and impossibly beautiful. We finally had to pry ourselves away to return our bikes, pedalling home with the moon guiding our way. Kathmandu, Nepal, April…We managed to find bikes to rent and cycled from Kathmandu to Bhaktapur. The Nepalese greeted us as we passed, children ran behind us with mischievous smiles and antics. The friendliness continued as we rolled into the medieval city of Bhaktapur and got swept up into the improbable spectacle of the ‘Biscuit Festival’. An immense, brightly painted wooden pagoda was hauled through the street with much excitement. But the side streets we later cycled were the highlight for me with stunning intricate carvings of Nepalese architecture. 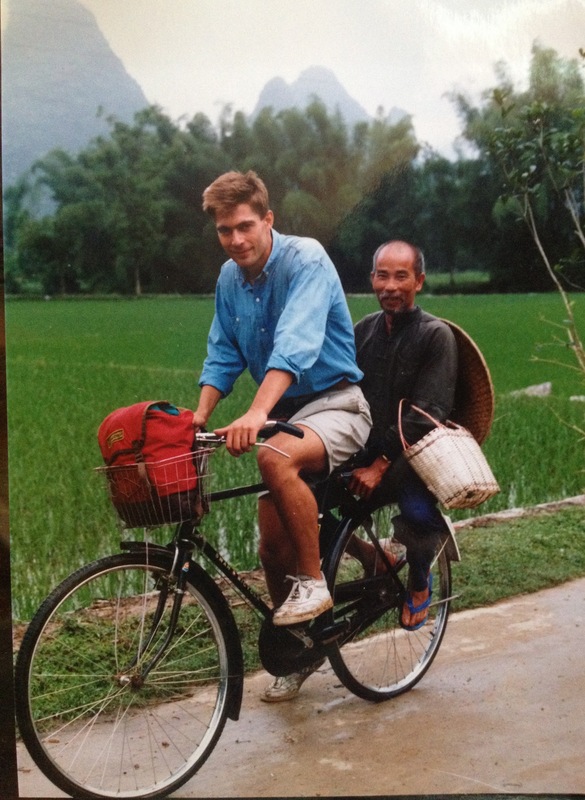 Beijing, China, June…Last week the experience of Bruce offering a ride to a rice farmer cut through culture and language. Against the emerald green rice paddies in Yangshuo, with water buffalos ploughing the fields, we cycled in bewilderment. It was as if we had been dropped into a National Geographic article. Contrast to today, we tackled ‘bicycle kingdom’ as it’s called. There are 4 million bicycles in Beijing! We dodged and weaved. We passed locals going home from the market with upside down chickens tied to handle bars; their squawking adding to the cacophony of tinging bike bells and incomprehensible Cantonese. I can’t believe we found our bikes after we had stopped for lunch, for there must have been thousands of them alongside each other. 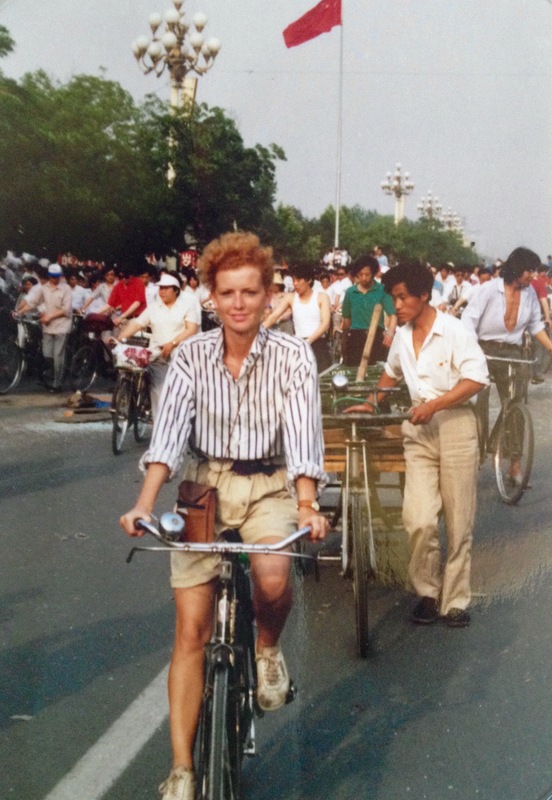 Our cycling experience in China would become far more dramatic as shortly after that diary entry, we were trapped in Beijing during the Tiananmen Square Massacre. Our bikes played an integral role in planning our escape; that however is a story for another time. We gladly embarked on an overnight cycling trip while we lived in Norway, only bikes and ferries on that adventure. Along the shores and through the islands we meandered, only sheep impeding our progress. 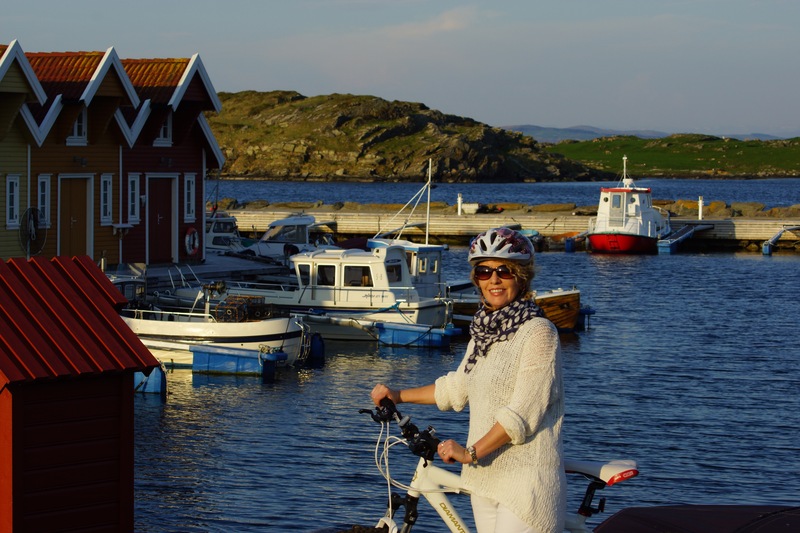 The Norwegian cycling infrastructure is also superb; paths routed along lush green fields and colourful fishing villages nestled tidily beside icy fjords. But unlike the Dutch, appropriate gear and helmets are the norm, one does not casually jump on their bike without paying heed to their attire. And I’ll give the Norwegians credit, there isn’t such a thing as bad weather, only inadequate clothing. By the time we had left Norway, I had acquired the requisite rain pants, jackets, boots, reflectors, even a ‘rain cover’ for my backpack. It all makes good sense when your bike becomes your chosen mode of transport. 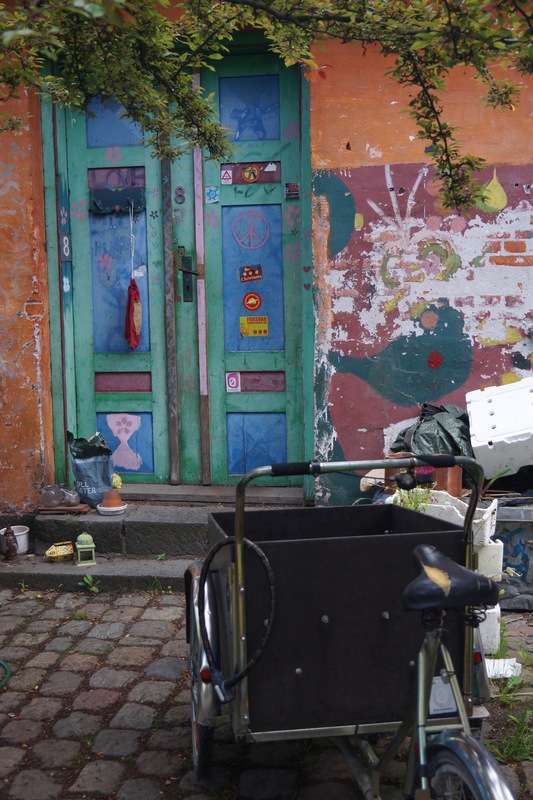 As I wrote this blog, I was conscious of the millions of people that don’t have the privilege of owning a bike, despite the vast improvement it would bring to their life. I came across World Bicycle Relief. This organization believes that a bicycle in the hands of an African student can change many things, and it does. 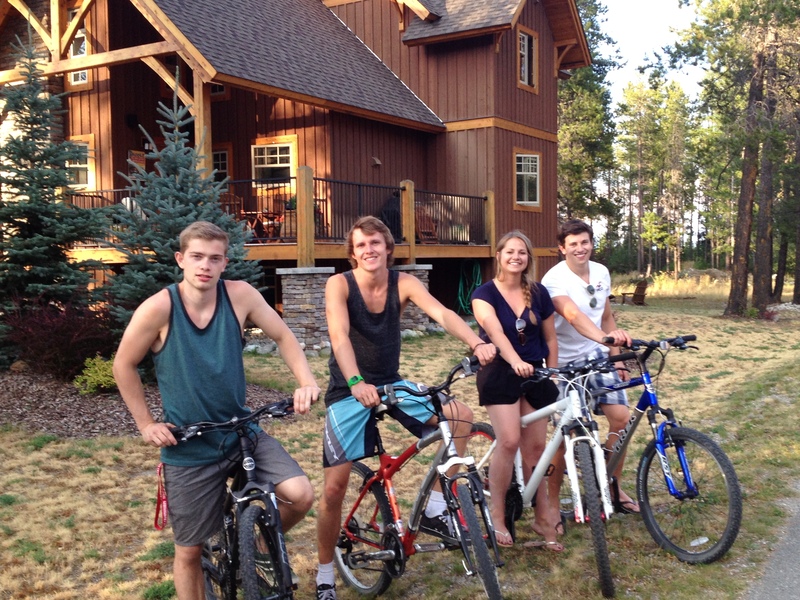 Bicycles for Educational Empowerment Program provides bikes to students, teachers and healthcare workers in rural Africa. 70% of the students this program donates cycles to are girls. 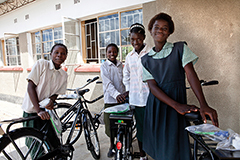 In places such as Botswana, Kenya, Rwanda, South Africa, Tanzania and Zimbabwe, to name a few, students using bikes mean covering greater distances, arriving safely at school on time, less fatigued and ready to learn. Grades and attendance improve for those students that have received bicycles. I listened to the story of Ethel, a vibrant fifteen year-old. Before owning a bike, Ethel walked more than two hours each way across hilly terrain to attend school. Now on two wheels, she is able to dramatically reduce her commute time, allowing more time to pursue her dream of becoming a nurse. Ethel also helps others in the community by offering rides when possible. I’ve decided to donate to World Bicycle Relief, to give someone like Ethel the opportunity to improve their life. I think of it as paying homage; to all the cycling experiences that have enlivened, coloured and enriched my life. I wish the same for them.